Offering you a complete choice of products which include plain covered paper favor cones for wedding favors and custom made chocolate boxes with dividers and ribbon ties. We manufacture a large range of Favor Cones in assorted sizes. 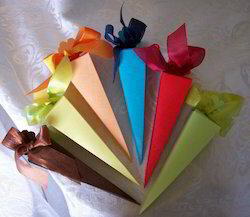 Our Paper Favor Cones are also available in Plain Colors Our Folding Paper Cone Boxes are widely used in Packaging Chocolates. We also make Folding Paper Cones, which can be custom printed as per your requirement. Our Folding Paper Boxes are also available with Embroidery and Ribbon Embellishments We manufacture a large range of Folding Paper Boxes.Our Folding Paper Boxes are available in a wide variety of Shapes, Sizes and Options We can custom Print our Boxes as per your request. Looking for Paper Boxes for Chocolates ?